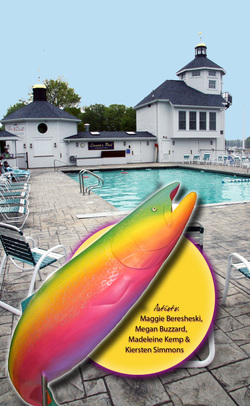 The fish owned by The Wilson Community Enhancement Charity, Inc., also known as WCEC, is displayed at the Linnea’s Pool at the Wilson Harbor. The fish has a sunset theme and was designed and painted by seniors Kiersten Simmons, Megan Buzzard, Madeleine Kemp and also sophomore Maggie Beresheski. In 1900, Timothy Wilson began showing movies in an outdoor pavilion at Tuscarora Park with a hand-cranked projector. Canvas would be draped around the building to make it dark inside. Twenty years later, a movie house was built in the village of Wilson on Young Street. The Gem Theater would hire piano players to accompany the silent movies shown. When sound motion pictures came to town in the 1930s, owner Francis Tate held viewings of Gone with the Wind. WCEC is a nonprofit organization that sponsors youth and community activities in Wilson including the outdoor movie series at Clark’s Park. The group also sponsors the Wilson 5K Salmon Run; Youth swimming program at Linnea’s Pool; Harbor Hoops 3-on-3 Basketball Tournament; adult and children’s concerts during the summer at Clark’s Park and various other community activities. The WCEC board includes: Walter E. Moxham (president); Marge Clark (vice-president); Elaine Schlosser (secretary); Jamie Moxham (treasurer); Maryanna Bull, Phillip Russell, Larry Elia, Kate Madden and Jim Madden.